President Trump has revived the Keystone XL pipeline, which President Barack Obama had nixed in his second term. We had often faulted Obama for playing down the number of jobs that would be created by the pipeline; at one point he did not even rely on an estimate from his own State Department. Give Trump some credit; his number is lower than some of the figures that have been touted by politicians over the years. But he runs into trouble by suggesting these would all be construction jobs. A White House spokesman did not respond to a query about the source of Trump’s figure. So let’s look at the most comprehensive estimate that was calculated, by the U.S. State Department. The Keystone XL pipeline is a construction project, and so the most direct jobs are related to construction. These are basically short-term jobs, lasting on average 19.5 weeks, to assemble the pipeline that would help carry heavy crude oil from Canada’s Alberta province to the Gulf Coast. Over two construction seasons, the main beneficiaries of the project would be Montana, South Dakota and Nebraska — each would need to hire between 2,700 and 4,000 construction workers — though Kansas would also hire about 200. Because of the difficulty in determining whether the project would last one or two years, the State Department decided to express all of the jobs as an annual figure. So those 4,000 construction workers in Montana who work for 19 weeks were turned into nearly 1,500 jobs on annual basis. All told, 10,400 construction workers, engaged for four- or eight-month periods, are expressed in the State Department report as 3,900 jobs — one position that is filled one full year — even though none of the jobs actually last a full year. The figure that really should be used is 3,900 jobs. But it is also correct to say that 10,400 construction workers would get jobs, as long as a politician made clear this was mostly part-year employment. The State Department also calculated that about 12,000 other annual jobs would stem from direct spending on the project. But some of these jobs have already been created. Workers in Arkansas, for instance, have already built about half of the high-strength line pipe needed for the project, some 333,000 tons. The rest of the pipeline was built in Canada, Italy and India, but Trump said he said signed an order stating “the pipe should be made in the United States.” So, if he follows through on that demand, the rest of the pipe, already built in other countries, would need to be built in the United States. So, for the sake of simplicity, let’s credit all of 12,000 jobs to the revived project. That still leaves Trump 12,000 jobs short. The State Department calculates another 26,000 jobs through “indirect and induced spending.” Some of that could be goods and services purchased by contractors, but it also means spending by employees working for a supplier of goods and services. An appendix to the State Department report, for instance, says that 634 people would be employed in the “arts, entertainment and recreation services” in the United States as a result of Keystone XL — and only 138 of those jobs would be in the construction states. No single dancer in New York City is going to get a job because of Keystone XL, but just as the part-time work of the construction workers adds up to jobs expressed in annual terms, the economic model assumes some of that spending reverberates through the economy and eventually lands in the pockets of people across the country, thus contributing to a portion of their annual wage. But in terms of construction jobs, even ones created through indirect spending, the total that emerges is 6,801 jobs. The number of manufacturing jobs (such as the pipe workers) that would be created amounts to 4,552. The State Department report adds an important bit of context — all of the jobs that supposedly would be created, direct or indirect, represents just 0.02 percent of annual economic activity across the nation. Trump said that Keystone would create 28,000 jobs, “great construction jobs.” In reality, the pipeline would create 3,900 construction jobs, though the figure could be pushed to nearly 7,000 construction jobs if you include indirect effects. The total number of direct jobs created, including construction, amounts to 16,000, according to the State Department. It’s important to get these numbers right and not over-promise the results of presidential action. 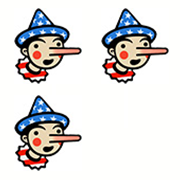 We wavered between two and Three Pinocchios but Trump’s suggestion these were all construction jobs tipped us to Three Pinocchios.